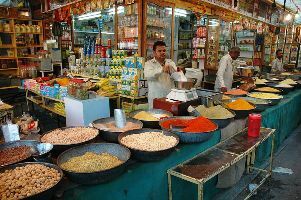 "Sokoni" is the main distributor of Indian Food, Indian Drinks, Indian Herbal oils, Indian Herbal and ayurvedic medicine and other Indian grocery as well as British Food, Pakistani Food, African Food and other Asian Food and Drinks in Bulgaria, Romania, Greece and neighboring countries such as Turkey, Macedonia, Kosovo, Moldova and Ukraine. Products distributed from other Asian Countries including Pakistan, Filipino and Indonesian, Sri lanka. Products distributed and in stock from West African countries such as Ghana and Nigeria as well as other Asian products all over Europe and especially to Bulgaria with orders over 25Euros while for Romania and Greece with FREE DELIVERY with orders over 50Euros only. Term and conditions apply please read the full Shipping and Returns policy. So if you are searching for natural products for your home, shop, restaurants, yoga studios, summer vacation Whether it be food, drinks, cooking oils, ayurvedic massage oils, lanterns, candles, incense stick, aroma lamps, lentils, beans, rice, tea, biscuits, ready to eat meals, flour, atta, chappati, naan, bread, sauces, kelloggs, nestle, TRS, Top Op, Fudco, Tropical Sun, Hesh, Ayumi, Dabur, Khadi then search no further and drop us an email to find out how we can supply you. No matter whether you want your products delivered to your permanent home or your holiday home we will make sure you get your products on time every time. We carter for Individuals as well as business whether it be a shop, hotel or restaurant. Please note some countries have custom regulation and we strongly advice you to check what the custom regulations are before you place an order with SOKONI Foods Europe, Specialist in Indian, British, African, Asian food & Drinks. Based in European union which means all our products are safe to import within the European Union Countries. No matter what quantity you require within Europe we will be pleased to deliver it to you at your convenience. If you are operating a restaurant or similar business and need more information on our products and services please do not hesitate to contact us. If there are products you would like and are not on our website please contact us.and it will be our pleasure to include and provide such products. Please note for a limited time only we would like all our clients existing and New to note that the following promotion of FREE DELIVERY ON ALL ORDERS OVER 25EUROS within Bulgaria to courier office of Speedy Bulgaria and for Romania and Greece 50Euros delivery to your given address shall apply. Please contact us. before hand for our special prices and delivery confirmation.